This care, with a very pleasant cream texture, incorporates nácares of green tint to neutralize the redness. Specially formulated for sensitive skin, with transient redness (flush) or permanent redness (Couperose, Rosacea). The 1st care that acts directly on the main factor responsible for the dilation and thinning of the skin capillaries (sources of permanent redness-VEGF), due to the action of the Patented Rosactiv Complex. Has soothing and protective action of the skin, diminishing the discomfort and protecting against external aggressions and causative agents of redness. Heat sensation, appearance of difused or localized redness, tingling and stinging, are characteristic symptoms of sensitive skin that easily becomes dehydrated. Depending on the magnitude, and skin sensitivity phase, Bioderma developed Sensibio line, which proposes combinations of effective active ingredients, with appropriate textures for each skin type. Sensibio line is formulated with patented Toléridine complex that acts immediately and permanently against inflammation, increasing skin tolerance. Apply Sensibio air, 1 to 2 times per day on the clean skin, preferably with Sensibio H2O. 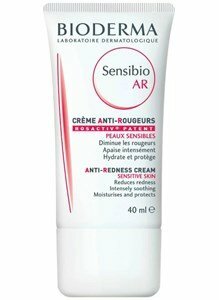 In case of an acute crisis of redness, associate the Sensibio Strong, with a fast soothing action. During sun exposure, we recommend applying a sunscreen with SPF 50 +, in order to protect and prevent exacerbations of redness.